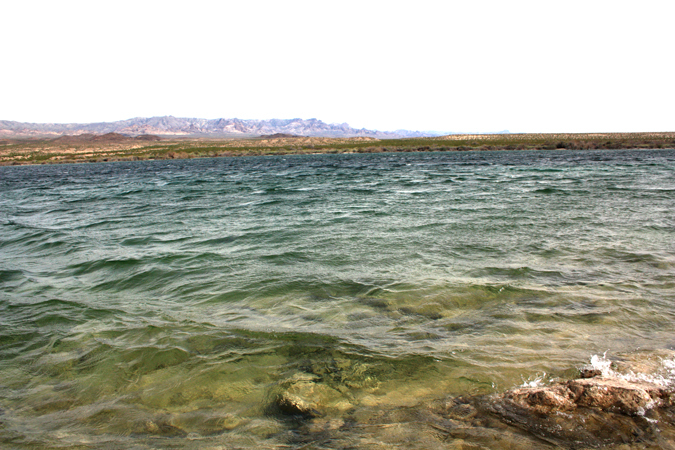 Lake Mohave is one of the upper Colorado River lakes on the border between Nevada and Arizona. 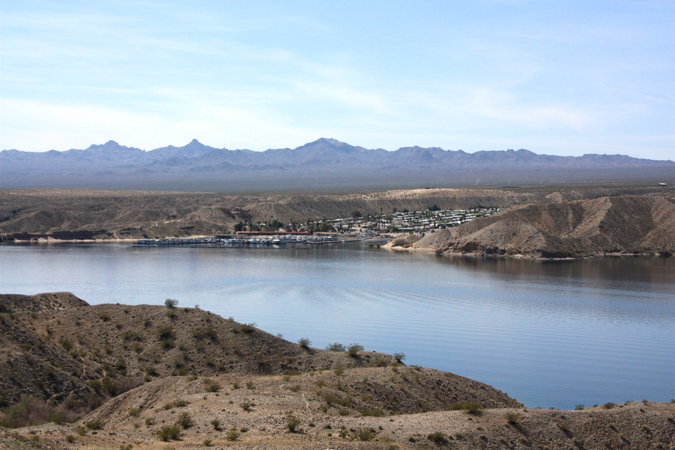 It extends from Hoover Dam at Lake Mead to Davis Dam at Bullhead City, a distance of approximately 67 miles. 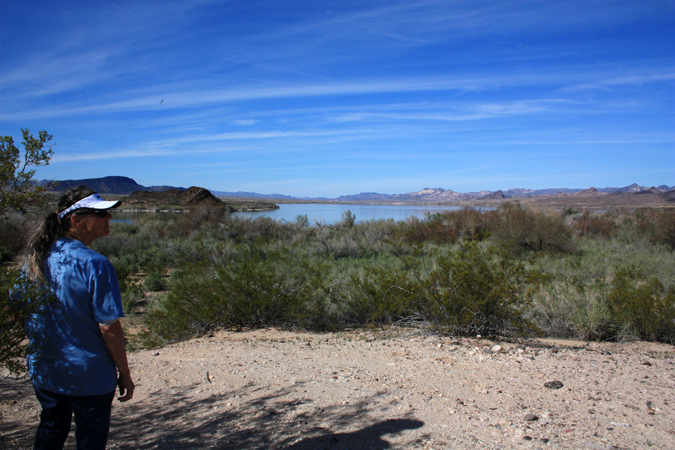 In early March, my wife and I traveled up that way to see what the Arizona side of the lake was like. We used the unpaved Cottonwood Road to access the area. Although it was 20 miles of graveled surface, the road was in very good condition and we made excellent time. 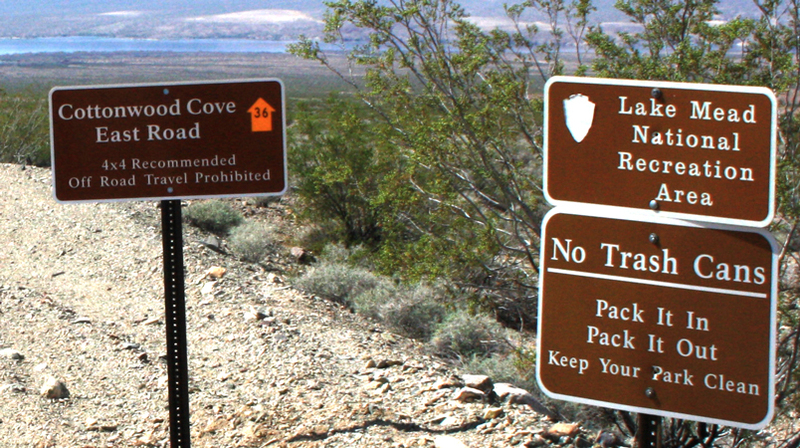 Cottonwood Road exits Highway 93 between Mineral Park and Dolan Springs. 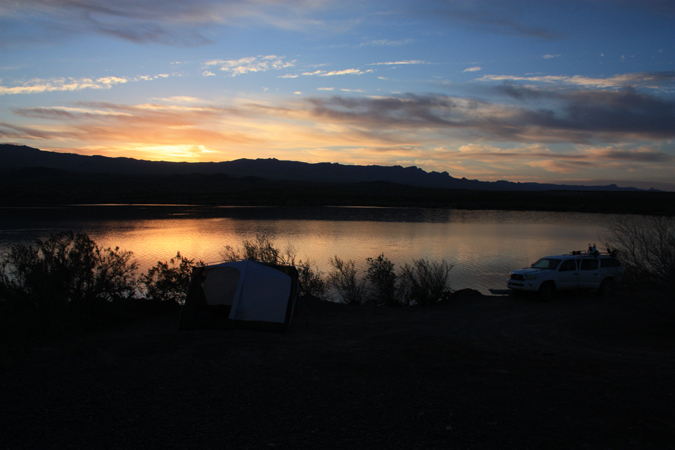 We chose to investigate the Arizona side, because it was reported to be more primitive than the Nevada side. A full size version of this map can be found here. 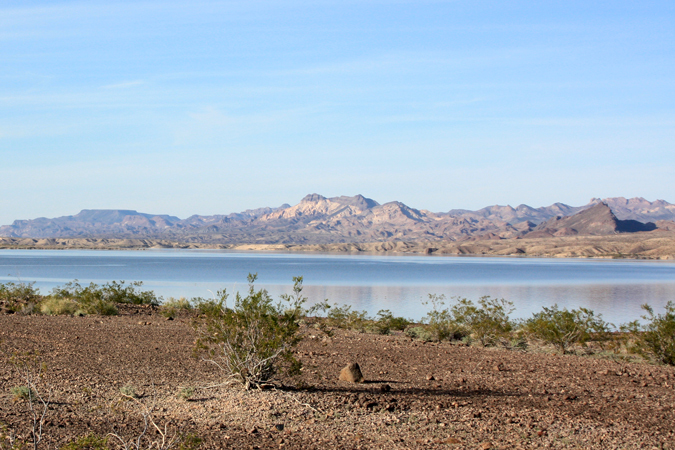 Lake Mohave is a part of the Lake Mead National Recreation Area. 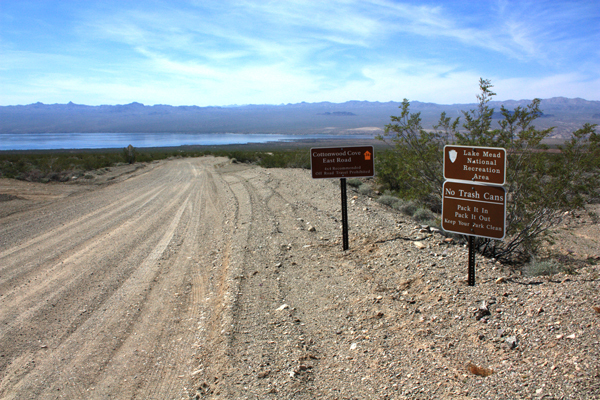 These signs mark the boundary of the Recreation Area where it crosses Cottonwood Road a few miles east of the lake. Inside the Recreation Area, vehicular travel is regulated. Only roads that are signed with travel arrows are open. 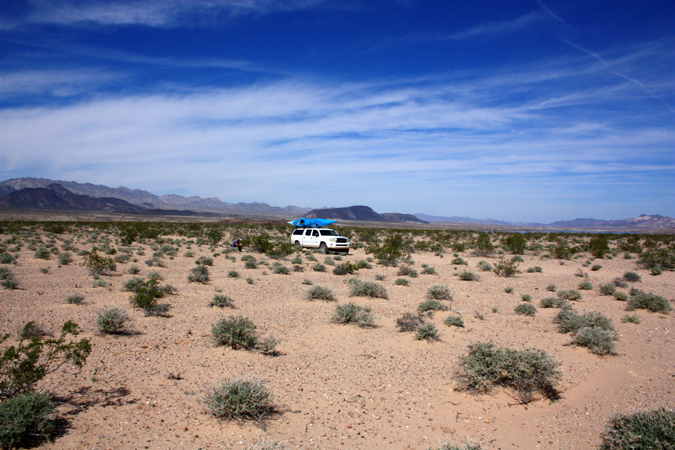 We were really surprised to find that so little of the shoreline was accessible to vehicles. The Park Service recommends having 4 wheel drive available. We used our 4 wheel drive on sections of roads 38 and 38A. The vegetation on the slopes above the lake is pretty sparse. 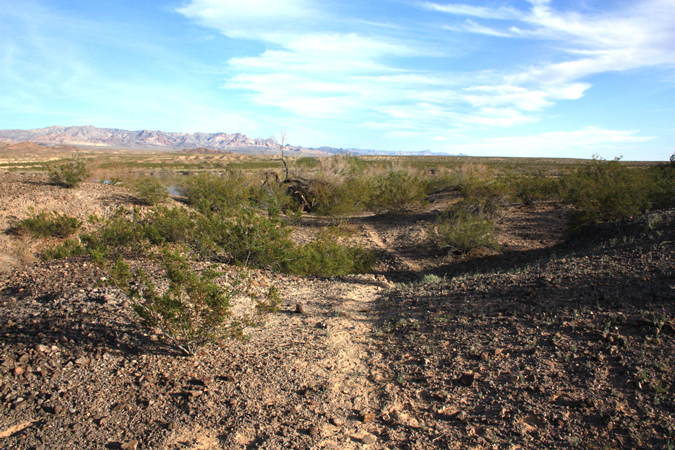 Creosote bush is very common. The elevation at the lake is only 641' above sea level. That was surprising. The plant growth is very different along the shoreline. 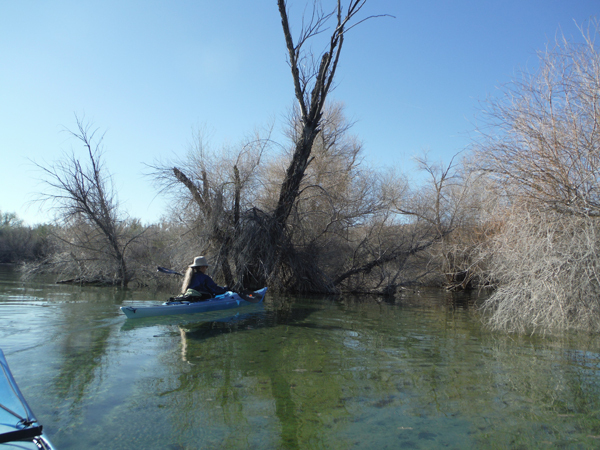 Willows, tamarisk and mesquite form dense thickets. 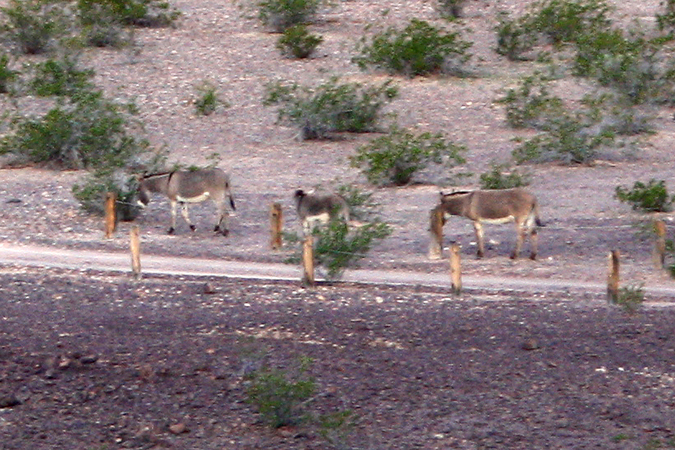 Burros are thriving in this environment. It was not unusual to see a half dozen or so at any one time. There were nightly presentations by the donkey and coyote "choirs". 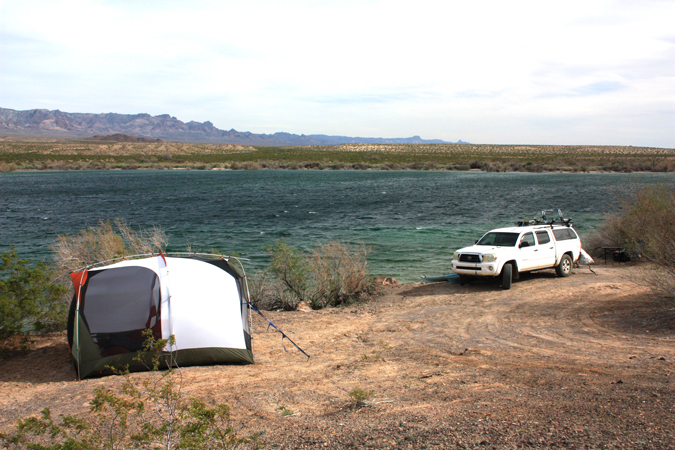 Camping in the area is allowed only at the ends of the roads. 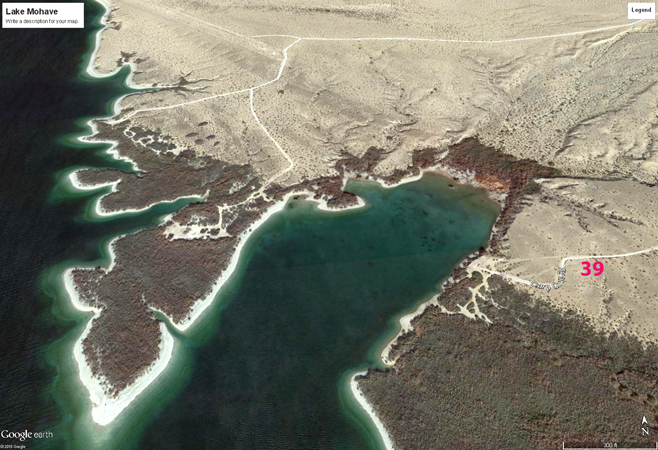 This Google Earth view shows how campsites have been cut into the growth along the lakeshore at the end of the "39" road. 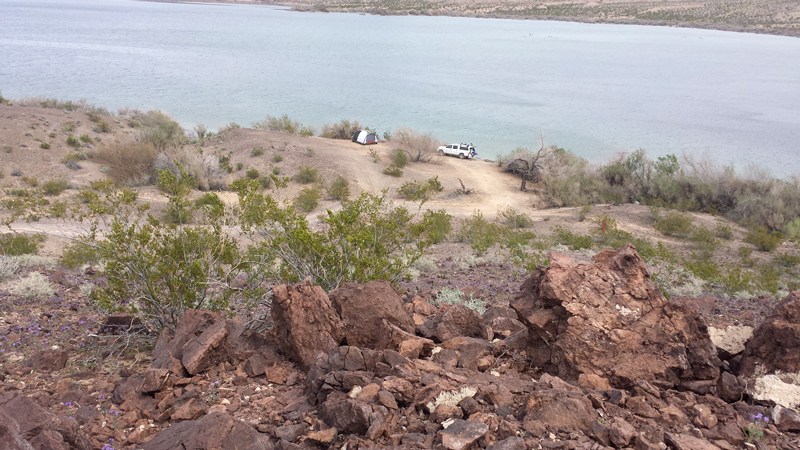 The only development on the Arizona side of the lake is the single outhouse shown on the map above. There are no tables, launch ramps or other amenities. 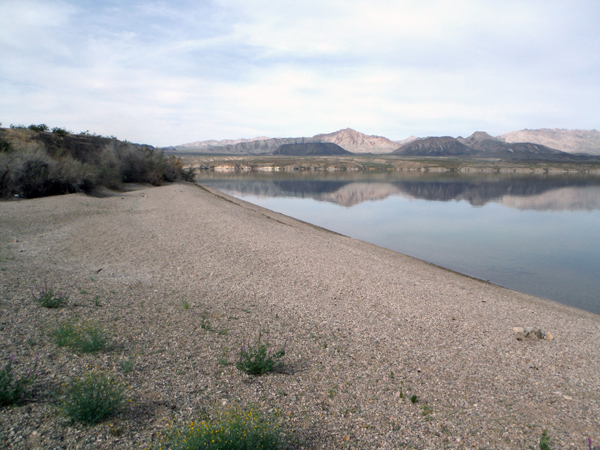 This is a view out into the lake from one of the sites. 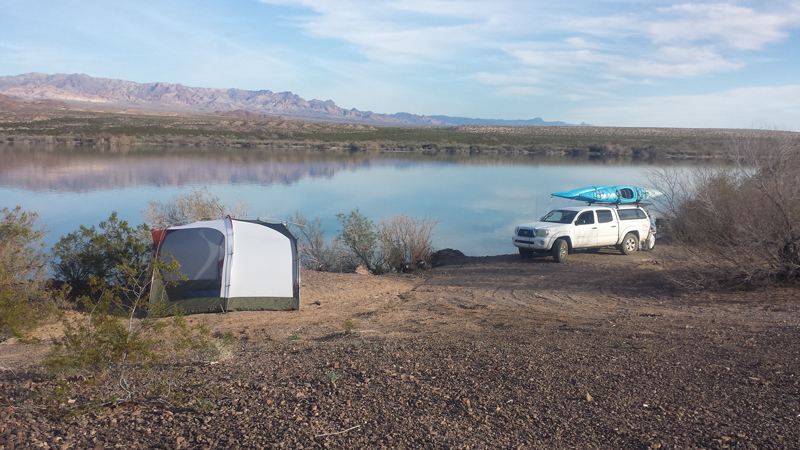 We ended up at a campsite on the point between the old river channel and Arizona Bay. That site would be our base of operations. 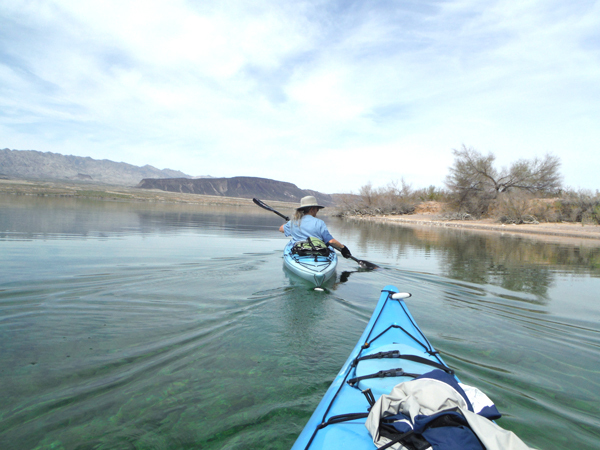 From there, we paddled around the head of the bay on one outing and on another trek made a large loop up to Yuma Cove. The peninsula of land is called Restoration Point. Historically, it appears that there were several roads out to different locations on the point. Only the road identified as "CC East Primative" on this map remains open. The views out from the camp area were great. 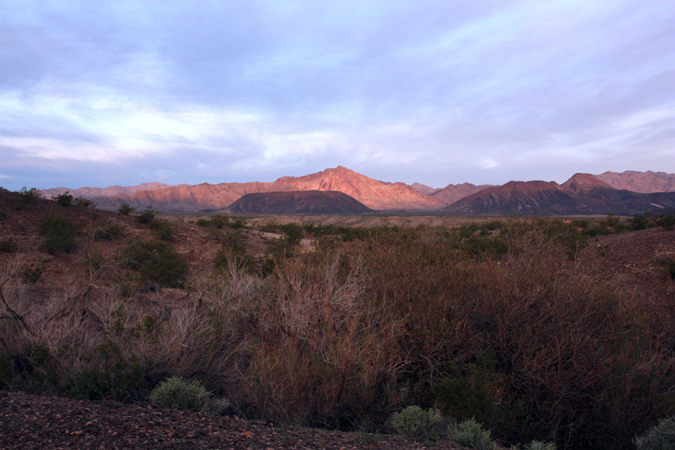 To the northeast were the rugged Black Mountains on the Arizona side. 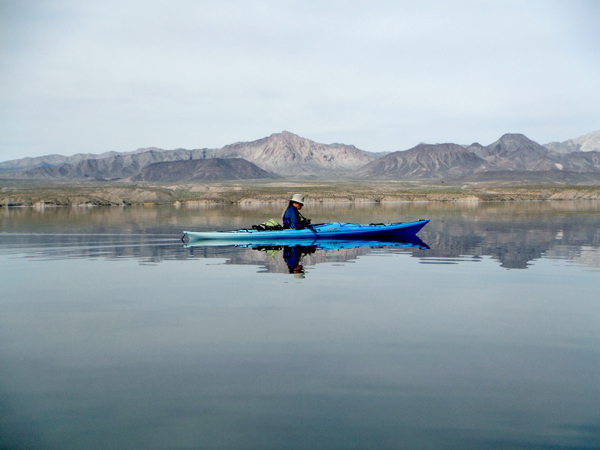 Each morning, the mountains over on the Nevada side reflected the sunlight nicely. This was often the view just before sunrise. Sunset views were equally nice. 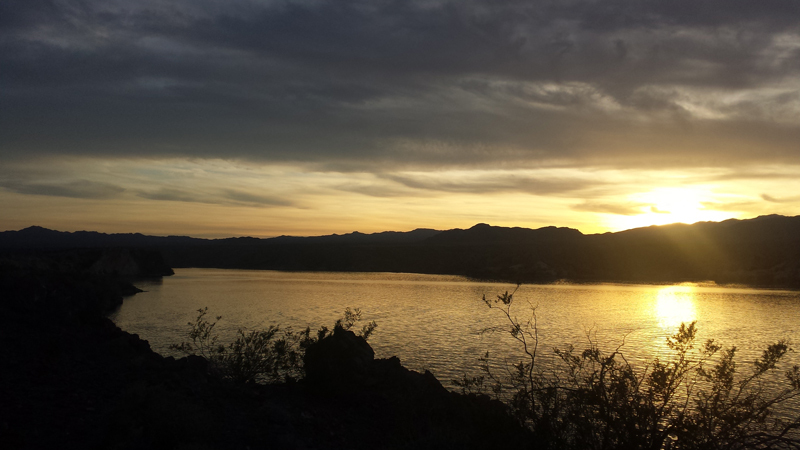 This was one scene across the river/lake channel to the west of Arizona Bay. 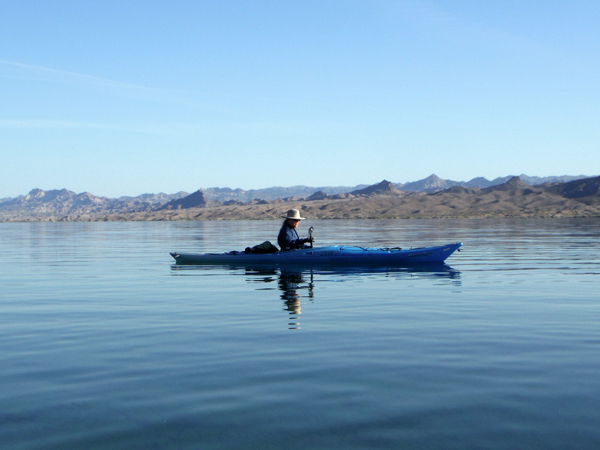 We found early mornings to be the best time to be out in our kayaks. The surface was often like glass. 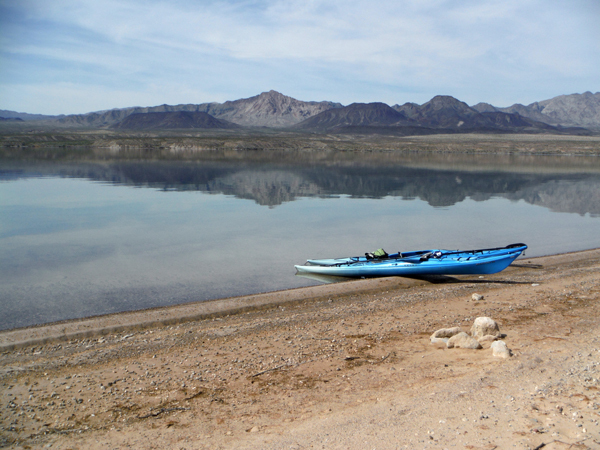 Whereas Lake Mead was reported at 40% full, Lake Mohave was at a level of 91%. There was a minimal "bathtub ring" visible along the lake shore. 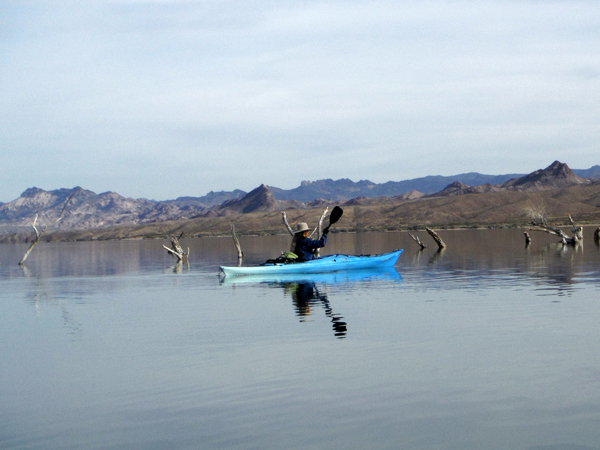 Kayaks can investigate areas that are pretty much inaccessible to power boats. 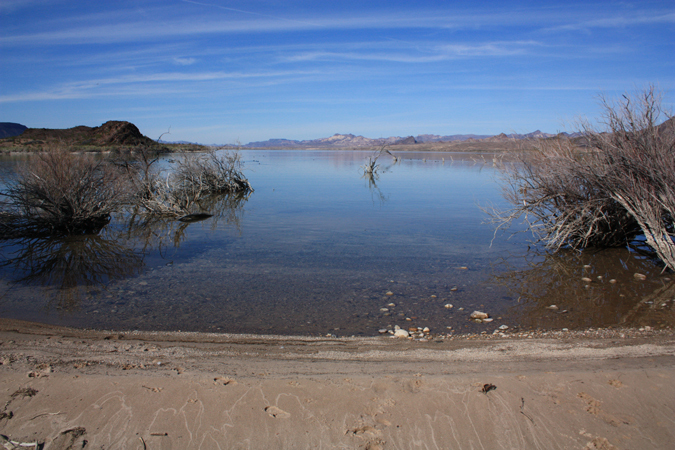 Lake Mohave is known for its water clarity. We found that if we were really quiet that we could drift up onto some very large fish. 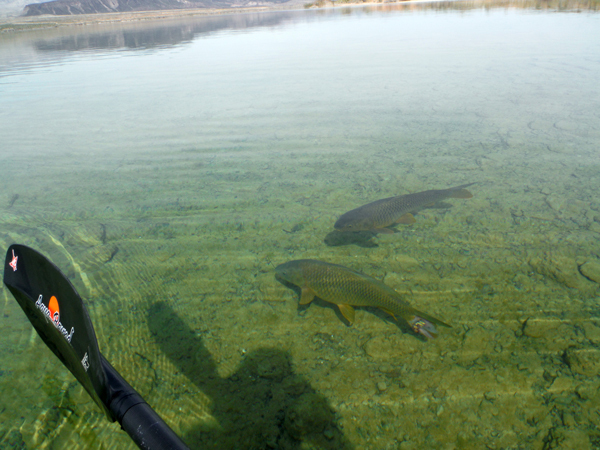 These were a couple of the many carp that we saw. The water was probably 3'-4' deep. We also spied on several large catfish. 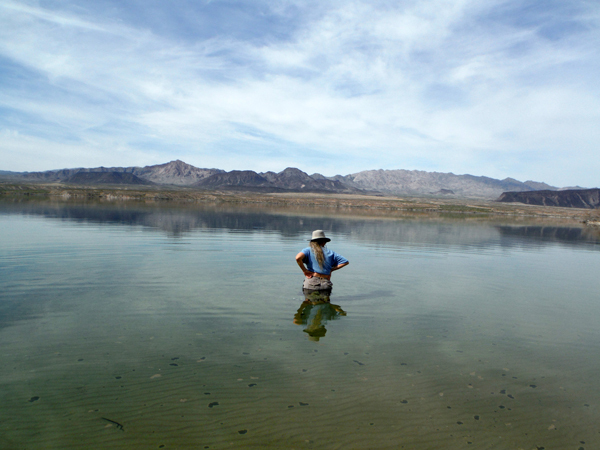 With air temperatures in the 80's, the 60 degree water temperature could be tolerated pretty well. 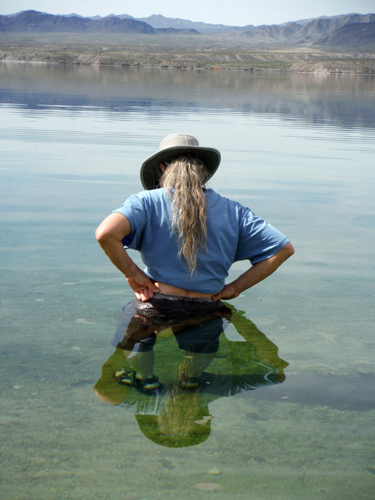 The clarity of the water is further demonstrated in this photo. There were many very nice beaches along the shoreline. It is permissible to boat camp on these beaches. The lake is also known for its wind. Since this was our first time in the area, we were really careful about the distance that we traveled away from our camp. Each day, the wind came up around noon time. That timing limited how far that we could venture out. These photos show the effect of the wind on the bay where the fetch was only about a half mile. We did not go over to the main channel to see what it was like where the wind could run along the water for many many miles.... We have read that the waves can rise to more than 3' in height! 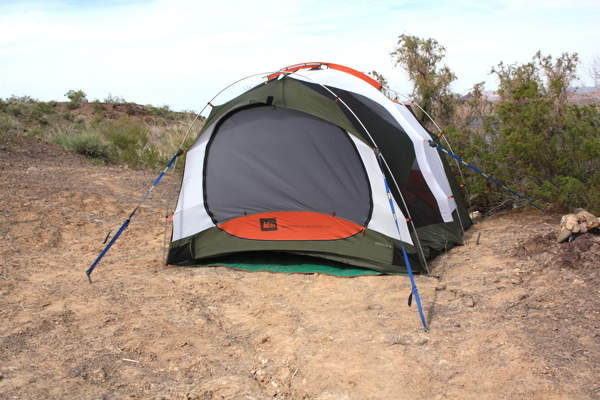 With some extra strapping, we were able to brace our tent and keep it upright. So how did we occupy our time when the wind was blowing? The countryside away from the lake was open. 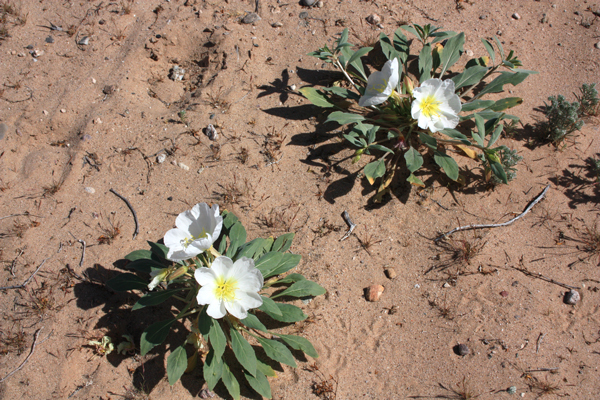 It was easy to wander cross country just to see what kinds of rocks and plant growth could be seen. 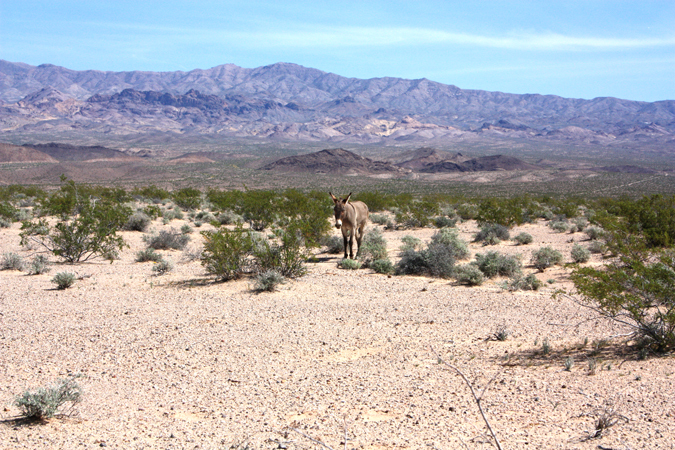 It was interesting to walk the burro trails to see where they went. 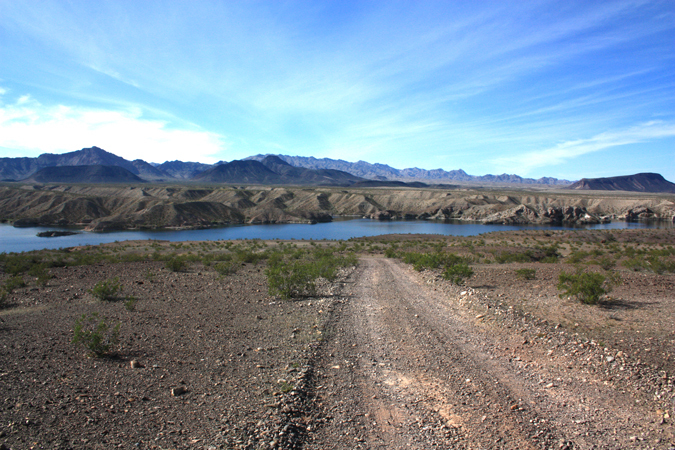 The road out to Restoration Point offers a view across the lake to the development at Cottonwood Cove on the Nevada side. 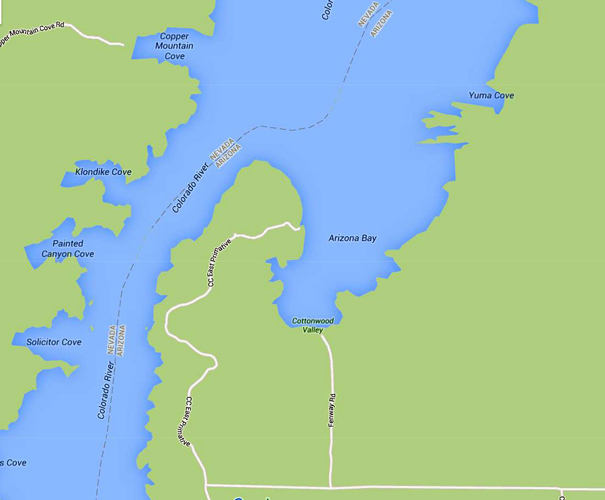 While the east side and westside of the lake are physically separated by a distance of less than a half mile at this location, the travel distance between the two places by road is more than 100 miles.